Biopsy—taking a sample of the suspicious tissue for laboratory analysis—is generally required to make the initial diagnosis of lymphoma. Information from biopsied tissue allows oncologists to consider the cancer’s molecular characteristics, or all the different nuances of the cancer cells’ genes and proteins, and leverage that information to optimize treatment. Biopsies thus give doctors vital information essential for diagnosis and treatment. Despite their unquestionable value, biopsies are not without risks and limitations. In addition, people who’ve been diagnosed with lymphomas also need to have their disease “sized up” at different points: initially, to see how widespread it is during staging; later on, to see that it is shrinking in response to therapy; and much later on, in monitoring, to make sure your doctors are on top of things if the cancer ever comes back after the initial treatment. Again, the value of imaging is undeniable, but imaging has its own set of drawbacks, such as exposure to radiation. That is why these tests are used conservatively so that the benefit outweighs the risks of exposure. Today, the gold standard method for sizing up the cancer as described above is imaging. Specifically, computed tomography (CT) and fluorodeoxyglucose (FDG) positron emission tomography (PET) scanning are often used for staging and to determine the cancer’s response to treatment. Often the two techniques are combined, and it is called PET/CT. While these advanced imaging tests are valuable and have improved patient care in lymphoma, they are associated with exposure to radiation, costs, and in some cases, a lack of precision. All of these things have spurred researchers’ interest in finding newer, more precise, less costly and less invasive ways to size up a person’s cancer. One goal is to find specific markers, such as gene sequences, that can be measured simply by a blood test to keep tabs on the cancer so that for instance you might not have to undergo scans as regularly during monitoring in the future. When cancer cells die, some of their DNA ends up in the blood. DNA from dead cancer cells is called circulating tumor DNA, or ctDNA. Scientists have developed tests to detect this circulating DNA. 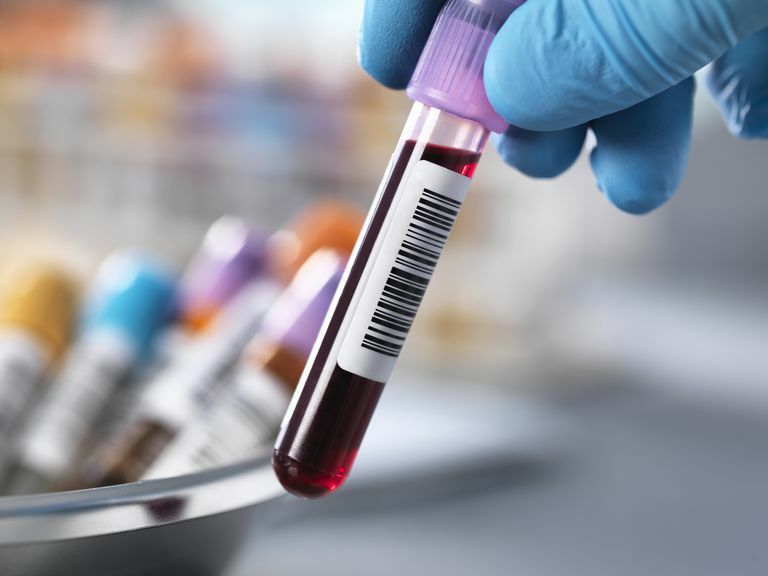 This kind of approach is sometimes referred to as a “liquid biopsy,” and investigators point to potential benefits for monitoring disease, as well as predicting a person's response to therapy early on. In a published study, investigators at the National Cancer Institute analyzed blood from 126 people with DLBCL for the presence of circulating tumor DNA. Diffuse large-B-cell lymphoma, or DLBCL, is the most common type of lymphoma, a blood cancer that begins in certain cells of the immune system. Despite having a similar appearance under the microscope, different subsets of DLBCL can have different prognoses. According to the American Cancer Society, overall, about three out of four people will have no signs of disease after the initial treatment, and many are cured with therapy. The cancer recurs in up to 40 percent of people, however, and it is then often incurable, especially when it comes back early and/or when levels of tumor cells in their blood are high, according to the National Cancer Institute. Everyone in the present investigation had received treatment for DLBCL according to 3 different protocols, with drugs such as etoposide, prednisone, vincristine, cyclophosphamide, and doxorubicin, known as EPOCH, with or without rituximab, in clinical trials between May 1993 and December 2013. Blood testing was done before each chemotherapy cycle, at the end of treatment, and every time staging was assessed. People were followed for many years after therapy, and CT scans were done at the same time as the blood testing. People in this study were followed for a median of 11 years after treatment—that is, the middle number in the series was 11 years, but people were followed for both shorter and longer periods. Of the 107 people who had a complete remission of the cancer, those who developed detectable ctDNA in the blood samples were over 200 times more likely to have their disease progress than those who did not have detectable ctDNA. The blood test was able to predict which people would not respond to therapy as early as the second cycle of anti-cancer treatment. The blood test also enabled the detection of cancer recurrence a median of 3.4 months before there was any clinical evidence of disease, in advance of detection via CT scan. Currently, liquid biopsies in DLBCL are investigational and are not FDA approved or recommended by NCCN guidelines. The information provided by a liquid biopsy should not be used to guide treatment in DLBCL. There are still many unanswered questions and challenges involved in keeping tabs on cancers using molecular markers from blood tests, but the knowledge base is continually growing and improving. In the case of lymphoma, and particularly all the different types of non-Hodgkin lymphoma, the sheer diversity of these malignancies makes for challenging work. Even when considering the same malignancy, such as DLBCL, it is possible that a single marker might not work well in all cases. Eventually, however, the hope is that some of the excisions, needles, and scans so familiar to today’s cancer patients might be avoided and replaced by tests that detect these markers and measure their levels in the body. American Cancer Society. B-cell lymphomas. Diffuse large B-cell lymphoma. Melani C, Roschewski M. Molecular monitoring of cell-free circulating tumor DNA in non-Hodgkin lymphoma. Oncology (Williston Park). 2016;30(8). pii: 218406. NIH. Circulating tumor DNA in blood can predict recurrence of the most common type of lymphoma. What Are the Symptoms of Non-Hodgkin's Lymphoma? What Is Mantle Cell Lymphoma (A Type of Non-Hodgkin's Lymphoma)? What Should You Know About Post-Transplant Lymphomas?